Bringing Theory to Practice (BTtoP) Workshops are designed to share best practices in teaching pedagogy and strategies for implementation with faculty and instructors at UCLA. For our Winter 2019 workshops, there were more than 50 different attendees, and of the 21 who provided feedback, 70% found the workshop “excellent”, and 30% “very good”. The calendar and descriptions of upcoming BTtoP offerings is here. 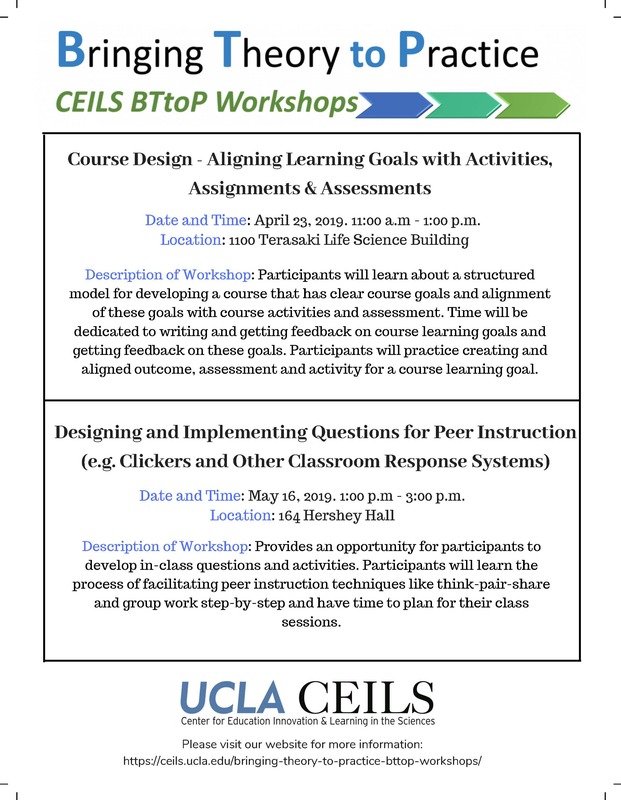 Departments can request workshop facilitation for these BTtoP workshops or other specialized topics at any time by contacting CEILS (media@ceils.ucla.edu) or Erin Sanders, CEILS Director (erins@ceils.ucla.edu). When is this workshop offered? We will offer this workshop prior to the start of classes each quarter. Individual and group consultation on syllabus design is also available by request. Who should attend this workshop? Faculty and instructors who are seeking feedback on their course syllabus, designing a new course syllabus, or who are looking for examples of best practices and inclusive language are encouraged to attend. Description of Workshop: This workshop will provide an overview of “backwards design” for planning your course, best practices for designing assessments and activities, and a variety of examples on inclusive language and model syllabi structures. Resources: We highly recommend the following resource as a starting point for developing your syllabus: Measuring the Promise: A Valid and Reliable Syllabus Rubric Guide to Assessing the Focus of Syllabi developed by Michael Palmer, Dorothe Bach, & Adriana Streifer at the University of Virginia, Teaching Resource Center. When is this workshop offered? Individual and group workshops and training on active learning is available upon request. Who should attend this workshop? Faculty, instructors, and Teaching Assistant Consultants (TACs) can benefit from this workshop. Description of Workshop: This workshop provides an overview of current research and best practices on the implementation of active learning pedagogy in the classroom. Several examples and practice activities will help participants quickly identify techniques they can incorporate quickly and easily into their own courses for improved learning outcomes. When is this workshop offered? We can offer this workshop to groups upon request. Who should attend this workshop? Faculty and instructors that are interested in utilizing evidence-based active learning techniques in their teaching. Description of Workshop: Provides an opportunity for participants to develop in-class questions and activities. Participants will learn the process of facilitating peer instruction techniques like think-pair-share and group work step-by-step and have time to plan for their class sessions. When is this workshop offered? Individual and group workshops and training on creating equitable classroom environments is available upon request. Description of Workshop: This workshop provides an overview of research conducted at UCLA as well as national data on issues related to equity, retention, and persistence in STEM education. Participants will discuss the difference between equity and equality, and learn about how implicit bias and stereotype threat play a role in inhibiting student success in the classroom. Best practices to create inclusive classrooms and increase equity across all students will also be discussed. When is this workshop offered? Individual and group consultation on this topic are available upon request. Who should attend this workshop? Faculty and instructors who are seeking feedback on their teaching effectiveness and student experience are encouraged to attend. Description of Workshop: This workshop provides examples of several different strategies that instructors can use to solicit informal as well as more formal feedback from students. Sample mid-quarter evaluation tools will be provided, as well as sample questions that can be used across a breadth of different activities along with tips and strategies for implementation and responding to feedback. Who should attend this workshop? Faculty and instructors who are seeking feedback on their teaching effectiveness. Consultation available for department chairs that are interested in implementing a peer observation protocol or testing a pilot. Description of Workshop: This workshop provides tools, strategies, and best practices for conducting peer observation on teaching with colleagues. Who should attend this workshop? Faculty and research staff involved in assessment that involves conducting classroom observations. Also available to undergraduate Super LAs and TACs. Description of Workshop: Provides overview of COPUS (Classroom Observation Protocol for Undergraduate STEM) protocol, discussion of codes used to categorize classroom activities, practice using the protocol and interpreting COPUS data. Introduces participants to GORP tool for electronically capturing classroom observation data. Eddy SL, Converse M, Wenderoth MP. PORTAAL: A Classroom Observation Tool Assessing Evidence-Based Teaching Practices for Active Learning in Large Science, Technology, Engineering, and Mathematics Classes. CBE Life Sci Educ. 2015 Summer;14(2):14:ar23. doi: 10.1187/cbe.14-06-0095. .
Who should attend this workshop? Faculty and instructors who either developing a new course for the first time or interested in improving the effectiveness of an existing course. Description of Workshop: Participants will learn about a structured model for developing a course that has clear course goals and alignment of these goals with course activities and assessment. Time will be dedicated to writing and getting feedback on course learning goals and getting feedback on these goals. Participants will practice creating and aligned outcome, assessment and activity for a course learning goal. When is this workshop offered? We will offer this workshop prior to the start of classes each quarter. Individual and group consultation on implementing clickers is also available. Who should attend this workshop? Faculty and instructors who are seeking ways to increase engagement in their classes. This tool is particularly helpful for larger class sizes. Description of Workshop: iClicker is a polling software that uses remote devices to allow students to vote on multiple choice questions. This workshop introduces participants to the iClicker software and how to use it in combination with effective question design to add interactivity and increase student engagement in class. Best practices for designing questions and implementing the peer instruction model of question and discussion will be presented. Participants are encouraged to bring examples of questions that they have asked (or would like to start asking) to the workshop. Resources: Resources from this workshop are available on the CEILs website –> Resources –> Teaching Tools –> Active Learning –> Using iClickers for Peer Instruction. Description of Workshop: Group work, when well-designed, can help your students learn more, while building collaborative and interpersonal skills. In this workshop, we will discuss the benefits of group work, and then guide participants through a process of adapting best practices for group work into their own course(s) and assignments. We will discuss options ranging from informal groups in class or discussion to quarter-long group projects designed to enhance student motivation and accountability.